QNAP has today started taking preorders for its new TS-2888X AI-Ready NAS which is now available at a discounted price for early bird customers. Specifically created to optimise AI workflows, providing a “hands-on, ready-to-use software environment to reduce time and complexity for implementation and management”. 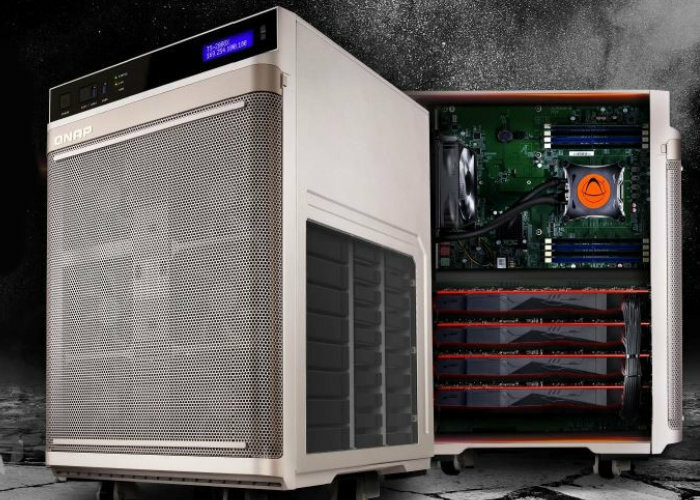 The latest QNAP NAS system is equipped with an Intel Xeon W multi-core processor, ASETEK CPU liquid cooling system, 8x DDR4-2666 ECC RDIMM slots, supports up to 512 GB, 8x PCIe slots, supports up to 4 graphics cards (maximum depth: 330mm), 8x 6+2 pin PCIe power connectors and 2,000 Watt PSU switch and connector. – The TS-2888X is powerful yet affordable, making AI accessible to your business blueprint. – Public cloud training is not suitable for confidential or sensitive data. Keep full control over all your data with the TS-2888X! – QNAP’s exclusive QuAI computing platform simplifies implementing AI workflows. – Data is the key to AI, and the TS-2888X provides the potential for huge capacities to remove the storage bottleneck from AI development. – Flexible backup tools and snapshot protection assure your data while also allowing efficient disaster recovery. For more details visit the official QNAP website by following the link below.